In 2016, our groundbreaking collaboration with Deloitte made a real difference for social entrepreneurs, organizations, and other problem solvers in our community. Below is a recap of some of the highlights from last year. We are so excited about what's to come in 2017! 1. The core of our collaboration with Deloitte involves bringing Fortune 500-caliber strategic support to social entrepreneurs and organizations in our community, so they can dramatically increase their impact. In practice, a New Profit senior leader and a team of pro bono team members from Deloitte undertake strategic planning and other projects with organizations. Last year, we completed or kicked off work with a range of high impact partners, including New Leaders, College Possible, First Place for Youth, Eye to Eye, Roca, New Teacher Center, Food Corps, Educators for Excellence, EnLearn, and Match Education. "After five great years of learning by doing, FoodCorps was ready to forge a multi-year strategy for significant growth, transformative impact, and systems-level change connecting children to healthy food. The case team Deloitte and New Profit so generously provided unlocked our own best thinking, brought Deloitte's depth of experience and insights to bear, and resulted in a plan that is ambitious, actionable, and––most important to me––authentic to FoodCorps." "Deloitte and New Profit's support for EnLearn on strategic planning helped us crystallize our focus for the future. The Deloitte team had integrated expertise and they approached our issues from all directions - data, technology, market opportunities, roadblocks - that helped us put things in context and make informed decisions. We appreciated that they came to each round of work more informed about our issues and more passionate about helping us increase our impact on equity in education." 2. 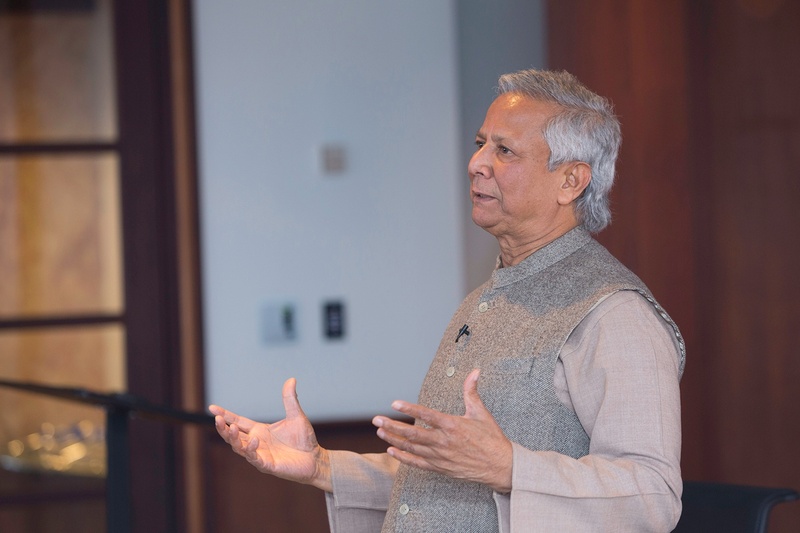 We co-hosted, with the Yunus Social Business Center at Becker College, an amazing and inspirational dialogue on social problem solving with Nobel Peace Prize Laureate Muhammad Yunus. The core question we confronted: How can we energize a new movement for problem-solving? With characteristic optimism, Dr. Yunus pointed out that, in some ways, we already have by bringing down the barriers that exist between sectors – nonprofit, business, government, and others – to allow for more dynamic and self-sustaining approaches. This is at the core of our Deloitte collaboration. 3. We participated in the Deloitte Foundation's National Case Competition for MBA students in Dallas. The case this year focused on New Profit's future, which marked the first time a social impact challenged was addressed by contestants. We were absolutely amazed at what we learned. 4. In part thanks to our experience at the National Case Competition, we co-published a piece in Fast Company about how millennials are taking leadership and reshaping the social problem solving movement. 5. Our longtime supporter and partner Mike Canning, a principal with Deloitte Consulting LLP, joined New Profit's Board of Directors. We have incredible momentum to build on in the year ahead! We want to thank our key Deloitte supporters - Stephen Jennings and Mike Canning at the New Profit board level, Doug Marshall and Dana O'Donovan and Joanna Burleson and Anna Muoio at the operational level, and hundreds of other Deloitte staff members - for committing their time, passion, and energy to helping us and our partners deliver greater impact for people seeking to overcome barriers to opportunity across the country.